This Toolkit contains a collection of generic set pieces I have created in my time as a dungeon master. It includes an assortment of dungeon maps, puzzles, fully detailed dungeons, random encounters, entire one-shot adventures, and tables to create hundreds of fun magic items. Most of these are able to be dropped in any campaign setting with just a small amount of work by the DM, providing at least thirty hours of content! These eight tables can help you create a huge assortment of custom magic items that stray far from the ordinary! Four of the tables provide benefits and the others provide detriments, allowing to craft all manner of magic item by rolling for special properties! These have 4 tiers each - starting from Minor enchantments and going all the way up to Legendary. Starting with things as simple as gaining a d4 for a particular stat to summoning powerful allies at the start of combat or becoming an avatar of the item itself! One-shots are adventures that contain an overarching story or quest and tie themselves up at the end of a session. 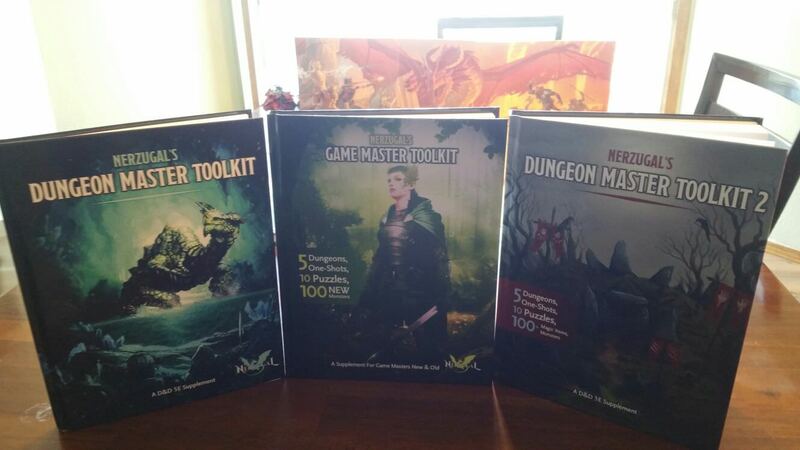 These are typically expected to last 3-4 hours (though some may take longer as noted in the adventures below) and are a great tool for newer Dungeon Masters who may be hesitant to jump into the deep end without assistance. They are also a valuable aid for an experienced DM that might be running low on prep time! Reading through the pages within this book should provide you with everything you need to run an exciting story for your players. Tread through the Bog of the Hag and see if you can escape with your jawbone still intact. Face off against the grand eyeless frog demon known as the Gol'Goroth and his army of cultists that have been terrorizing the small town of Goldenleaf Village! Challenge the fighting spirit of a novice set of adventurers by putting them up against the trials within Dromar's Tomb! 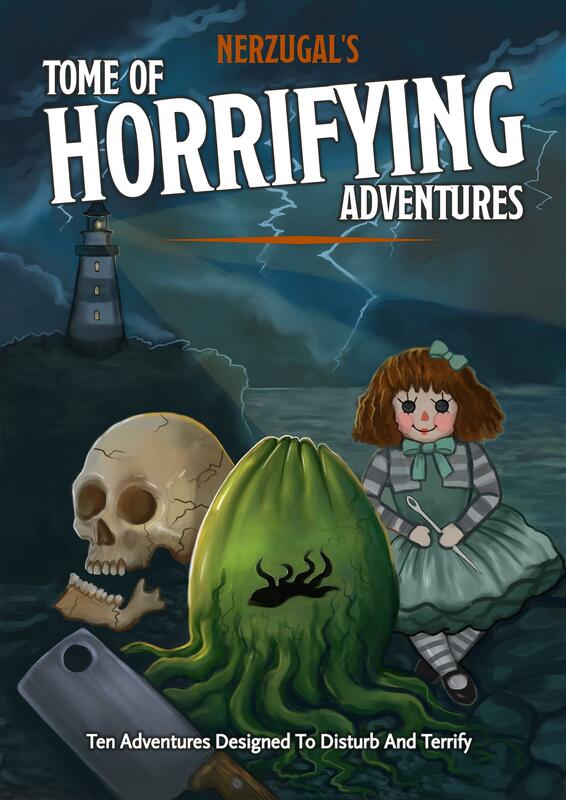 The Dungeons section of this book contains all of the monsters, puzzles, traps, and descriptions you will need to drop any of these four dungeons into your world with little to no effort! Unlike the one-shots, these do not have a story built around them and are simply a set of challenges set to the theme of that particular dungeon. Do your players have the knowledge required to solve the riddles of the dragon turtle that lurks within the Submerged Cavern? Can they adapt on the fly to successfully complete each wing of The Trial of Champions? Will they crumble in the face of the powerful constructs and challenging puzzles that lurk within The Tinker's Laboratory? A dozen puzzles to challenge your players. Most can be dropped into any dungeon or world with little to no effort on the Dungeon Master's part. All are unique puzzles that should hopefully catch your players off guard and give them a nice challenge beyond simply slaying powerful creatures. This Toolkit was just the beginning! To see my other products, click the links below! These books are amazing! So helpful. Just one question, are the Dungeons (The Submerged Cavern specifically) able to be run as a one shot themselves? The Submerged Cavern is one of the more combat light dungeons so if your players are fast, they might be able to get through it in one night! It took my own group two sessions to conquer that one as they solved the puzzles and riddles and found unique ways to face down the other challenges of the dungeon, but probably about 5 hours in total. My estimate would be 4-6 depending on hour pacing and combat speed. Ran it on NYE, everyone really enjoyed it. Had to drop it from 3 caverns to 2 because my group were super quick with the combat (the Mind Flayer was downed in 1 round - their initiative was insane) but they took their sweet time just deciding which way to go. An example of this is they split the party to look down each tunnel a little bit, then went with the first one, found the trapped step and set it off even though it was clearly a trap. Anyway, great stuff in this - already planning on running some of these with my regular groups! Hello. 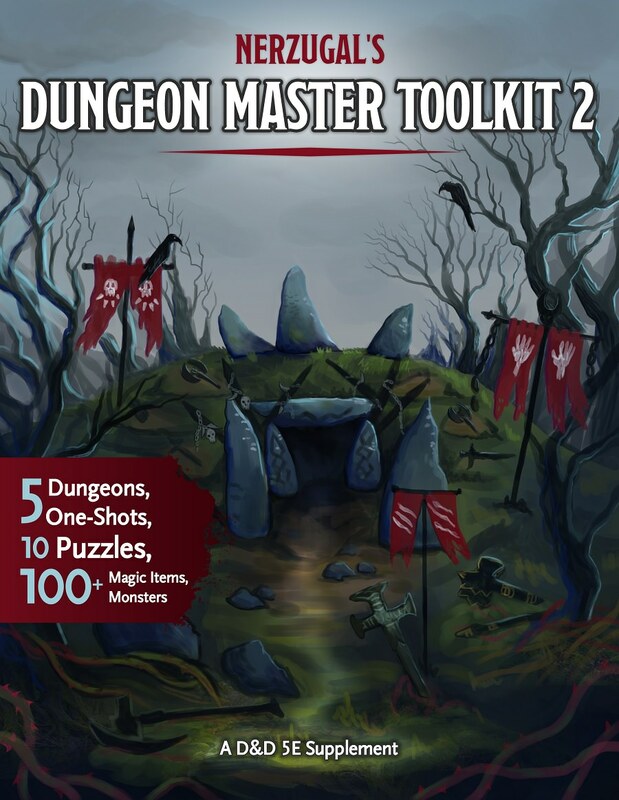 I purchased the DM Toolkin 1 & 2 and the GM toolkit. I paid for the PDFs, paying the recommended price and downloaded the PDFs. On all of them the table of contents is all weird greek lettering and unreadable. 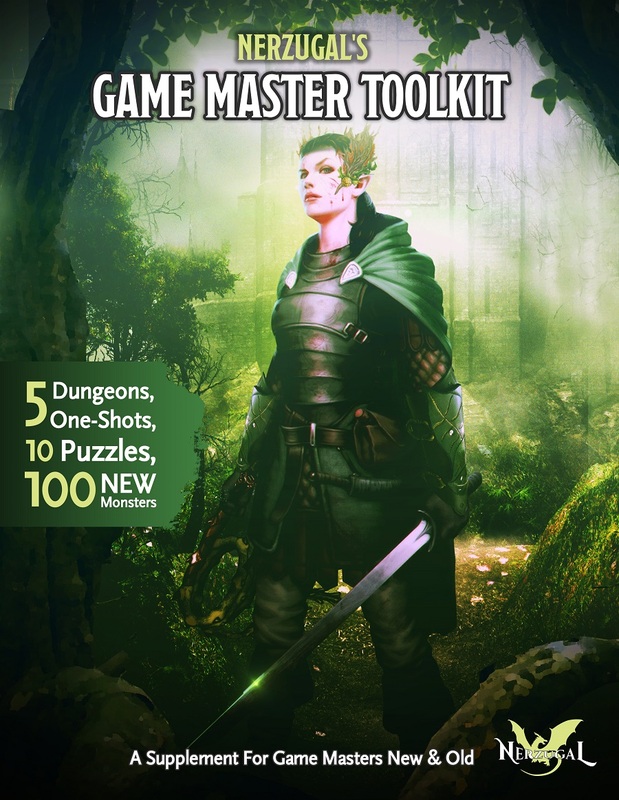 On the Game Master Toolkit the entire PDF is that way. Example: https://i.imgur.com/pPPBE7d.png from the GM Toolkit. Disregard the above, it seems to be an issue with the PDF viewer I was using (which is designed to read blueprints and architectural drawings). Opening it in adobe reader works just fine. Thank you! I like this book. It's fun so far. 1) One player is enough to open doors 1-4. 2) After opening door no. 4, they open door no. 7. One player than goes between door no. 2 and door no. 7 while the other stays back to reopen doors 1-3 after their friend opened door no. 7. 3) We trivially open door no. 5. 4) Now we open door no.6. For this, one player goes between doors no. 4 and no. 6, and the other stays behind as before. 6) At this point, teh only missing requirement for opening door no. 9 is to open doors no.1 and no. 2 which is (again) trivial. The puzzle is great tough, I'm glad to have read it. I hope...See more my feedback is valuable! Once I have the money, I'm going to buy your printed materials. The content in these works is top notch. You've inspired me to try and develop my own 5E content. Thank you! I love the looks of this. Is anyone working on a Fantasy Grounds implementation of this or the sequel? As a remote gamer, because I would rather play than code, I rely on FG modules and don’t mind paying for them. I’ve purchased a lot of Rob Twohy’s stuff and he seems to do a very thorough conversion, if he or someone else is not already working on it. Unfortunately, I don't think I am allowed to distribute any official FG modules since the product is published on the DM's Guild. It would violate their exclusivity agreement. I know I am at least not allowed to sell it in their store as I have already worked with them in the past on it. Now adding FG resources as part of the download for this might be ok (though I'm still not sure), but I don't have any plans of doing so at the moment. I am already diving deep on my next book and trying to keep the momentum going. Steven, you can AND SHOULD sell this as an FG mod separate from the PDF (fully complies with DMs Guild TOS). Search my name (Rob Twohy) and see how many collaborations I've done. I'd be happy to help. Sorry about the confusion. There is a section right after Room Description called "The Stone Inscription". This contains the text that is inscribed upon the wall. The wooden sign is what contains the pictures of what goes into each of the buckets. I suppose "text" is probably the incorrect word for this, but from a distance that may be what it appears to be to the characters. The characters can associate each of the pictures with the metal buckets hanging over the room. Alternatively, you can get rid of this sign and simply have these pictures inscribed directly on the buckets. Hopefully that provides some clarity! My group is running through Strahd and I (player) am getting the chance to DM a One Shot next week. I'm super excited to lead the group & our DM through the Cult of Gol'Goroth! The monsters in this are so sick & twisted. I love it! Thanks! The Gol'Goroth seems to be one of the most loved adventures I have produced! I have some ideas brewing for a resurrection of the ancient from demon for a higher level one-shot that I think will be just as twisted and exciting! What program is that you're using to organize? If that question is directed at me, the product is put together using the Homebrewery. I don't think you are supposed to link other sites so just search Natural Crit Homebrwery to get to it. Sorry for the delay in response. It's Realm Works. I love the book, I downloaded the print friendly version and there are a couple of formatting errors on some of the tables... Starting at page 9. Otherwise, this is a great product. Whoa, don't know how those guys snuck in there! Thanks for letting me know! I will get those fixed as soon as I get home from work. Sorry about that! Nevermind, haha, it should be fixed now! Great toolkit for inspiration or quick content! One thing thought. The seven digit puzzle says "the number created by the first three is GREATER than that created by the last four"
BUT THEN it states that "both sum up 15"
this is misleading and probably a mistake or typo. for the record the puzzle can even be resolved with that clue so I just simply took it out. BUT I wanted to let you know! Hey Mono, it isn't a typo but perhaps a confusion in the way it is stated. The SUM of the first three and the last four both equal fifteen, but the number created by simply taking the raw number is greater. * The sum of the first three numbers and of the last four numbers are both 15. Does that give some clarity? Thank you for the clarification Sire! I would pay $50 for a book but I’m limited on pdf. And I so want this. I'm glad you feel that way. Hopefully one day the DM's Guild will allow for us to create print copies of our products. Until then, the best you could do is maybe to print it out and bind it yourself if you really want a physical copy! So so good. Is there a map of the Yuan Ti temple that I'm missing? Unfortunately, all of the maps in this Toolkit were handmade by me and I am far from an artist. I tried at one point to create something that could be used, but the three stories of the structure made it quite difficult for me. Here was my effort of an example of a single floor - https://i.imgur.com/21rYkJa.png When I ran the temple, I drew out some of the major areas where the battles will occur (just a few simple rooms) and the rest is done via descriptions. Hopefully that helps! Great product! I think I found a typo on Page #4 Item #43 A dryad will PAPPEAR should they disturb it. Oh, that is definitely a typo. Thanks, Robert. I am actually planning on releasing an updated version of this guide before my next Toolkit goes out and comments like this are always really helpful. Hope you enjoy! An absolutely amazing product, you really should make it a fixed payment. Thank you. I like for everyone, no matter their financial situation, to be able to experience my products so Pay What You Want is fine by me! 100% recommend to buy this. It is well worth the $9.99. This is a really great product. If you can afford to do so, buy it. What edition is this for? This title was added to our catalog on July 19, 2016.